What have we here? It's a jet plane coming around a friendly corner in East Rutherford, New Jersey. It's the remains of US Airways ill-fated flight 1549 and I don't know where they are going with it, but they obviously took the scenic route to avoid traffic. I think next time they should consider using the Turnpike, don't you? That is one sharp turn. The skies weren't so friendly to US Airways flight 1549 back in January. You probably remember. The whole world watched as Capt Chesley "Sully" Sullenberger landed a jet plane in the middle of the Hudson River without the loss of one human life. It was a miracle and it was captured while it was happening on cellphone cameras and in twitter updates. It was relayed around the world in seconds in an amazing interactive demonstration of the power of the new media. The print and TV crowd did their thing too, interviewing survivors and covering the well deserved honors heaped on Capt. Sullenberger by a grateful nation for weeks afterward. Not a day went by without a mention of some kind. Then suddenly it was over. Everyone moved on to the next big thing and the "miracle on the Hudson" just wasn't news anymore. Meanwhile, the wreckage of the Airbus 320 was towed to Battery Park City and moored to a bulkhead just north of the World Financial Center where investigators from the National Transportation Safety Board spent weeks giving it a thorough going over. 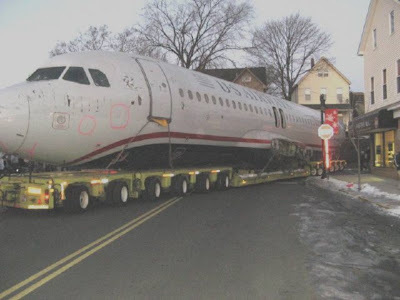 Once the inspection was done, the damaged plane had to be taken somewhere and here it is on its way. A friend emailed me this picture of it passing unheralded by the press, through East Rutherford, New Jersey. Just a footnote to history. I'm not even sure how recently this happened since there was zero press coverage. Even celebrity jet planes only get 15 minutes of fame these days, it seems. Exciting. Did she take the photo then? A unique photo, pinkpackrat, and an interesting story. It pays to have your camera ready when something unusual occurs. Good work. OMGoodness, this is the greatest picture. Of course you had to BLOG about it! Thanks for sharing. Amazing photo! Thanks for sharing it, and for giving Flight 1549 another 15 minutes of fame.